One of Colorado's best kept secrets! 20 minutes from Woodland Park. Mountain subdivision with 9 stocked trout lakes, golf course, and groomed ATV trails. 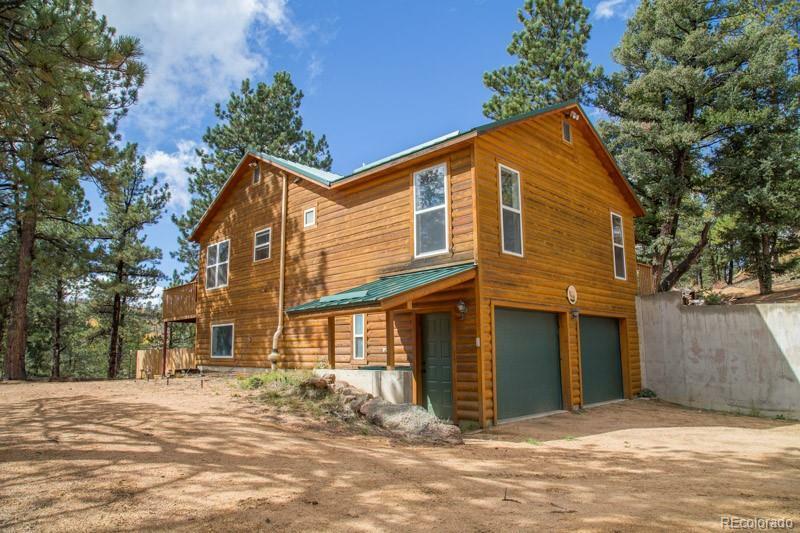 Immaculate 2+ bed/3 bath upgraded log home with vaulted ceilings, huge deck, and lower flagstone patio to take in that gorgeous forest setting. Attached 2-car finished and heated oversized garage. Open kitchen with granite counter tops, river rock backsplash, and a granite topped island. Beautiful wood accents, trim, and custom door frames throughout house. Natural stone entry. Entire house stained recently. Master on main with adjoining upgraded 5pc large bath suite with jetted tub- and check out that gorgeous river rock shower! Large family room downstairs with wet bar, 3/4 bath, and walk-out to the flagstone patio. 3 separate dog runs with fenced in back yard. Year-round county maintained roads. 28 acres in common area maintained by Turkey Rock Ranch Recreational Association. Start living your mountain log home dream today!